Frontispiece: Casey, in full-on vigilante mode, waxes nostalgic over his inner demons, the life he chose and paying his due when the time comes. Some years ago, a young Arnold Casey Jones confronts a hulking gangbanger named Hun. Hun and his Purple Dragons have burned Jones’ Auto to the ground, killed Casey’s father and currently has his mother and sister held hostage. The badly beaten Casey refuses to lie down and takes Hun’s blows. He attacks Hun with a knife, stabbing him in the neck. Enraged, Hun beats him to within an inch of his life. Fast forward to the “present” (the point in the TMNT timeline where this story takes place), Hun is being led out of a Maximum Security prison where his cronies, including the scar-faced Lin, await to pick him up. Over in New York, the Turtles are helping April and Casey clean out Casey’s mom’s old apartment that they’ve just moved into. April drops a box of old paperwork and begins to clean it up, though the content of the paperwork intrigues her. She takes the papers to Casey (now sporting a haircut). Turns out that they’re x-rays and newspaper clippings from Casey’s confrontation with Hun. Casey explodes at the prying April, not wanting to talk about it. At the dilapidated Champ’s Gym, Hun and his goons storm in past the guards and confront the leader of the “Black Dragons”. He apparently cut a deal with Officer Miller, which resulted in Hun being locked up and allowed him to gain control of the Purple Dragons. He then helped the Purple Dragons’ one-time-rival, the Shredder, wipe out the group, turning them into the Black Dragons: a gang subservient to the Foot Clan. Begging for his life, he tries to indicate that Lin had a hand in the Foot taking over the Dragons, but is silenced. Hun then wipes out the Black Dragons, declaring his intentions to rebuild his criminal empire. On the streets, an angry Casey is out on patrol. Following their run-in with the Foot Soldiers still loyal to the Shredder, Casey and the TMNT have taken to patrolling the streets more cautiously. Casey spots a hoodlum with a Purple Dragon tattoo watching guard on a stoop and, in his livid state of mind, makes a poor decision. Slipping on his hockey mask and grabbing a length of pipe, he knocks out the guard and heads into the building, alone. Casey sneaks up to a room and overhears Hun ordering a bunch of rival thugs working for The Baron to clear out of his turf. Casey bursts in and begins beating thugs, only to have Hun sneak up on him. Hun has heard rumors of a hockey-masked vigilante and is eager to see him face to face. Hun rips off Casey’s mask, but is distracted by one of The Baron’s boys, shooting at him. Casey takes the opportunity to escape, but has his photograph taken by one of Hun’s goons. Looking at the photo, Hun recognizes Jones. Back at the apartment, April is going over Casey’s old medical records. It seems that the beating he took from Hun as a teenager resulted in several mental and emotional disorders, explaining his often violent and erratic behavior. The next morning, the Joneses and Mikey are enjoying breakfast when Hun and the Purple Dragons show up. They take Casey and April hostage as Mike whisks Shadow to safety and retrieves the other Turtles. The Turtles quickly show up and do battle with the Purple Dragons. 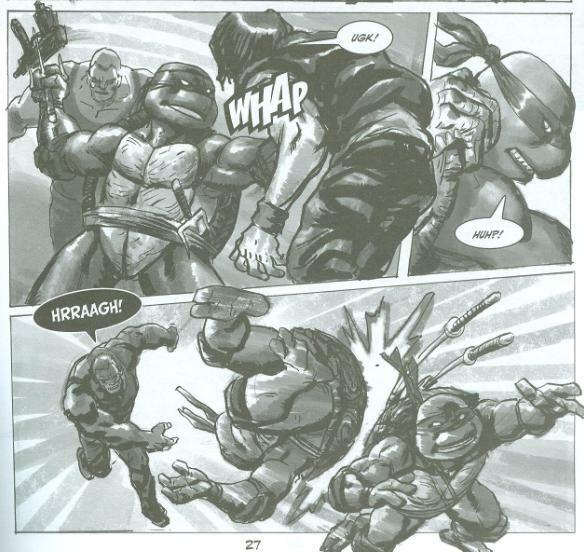 Hun makes short work of his opponents until Raph lands a sai into his leg. The police arrive and both the Dragons and the TMNT flee. Paramedics help Casey into an ambulance as April consoles him. Casey says he’s ready to talk about what happened, but April says it can wait. *This story is continued from Tales of the TMNT (Vol. 2) #36. *The story will continue in Tales of the TMNT (Vol. 2) #59. *Casey's father, Herb, was first mentioned as being dead in TMNT (Vol. 1) #61. That story placed his death at five years prior, though this issue would seem to contradict that dating. *A "fake" origin for Casey Jones was previously offered in Tales of the TMNT (Vol. 2) #37. *The Baron will appear in person in Tales of the TMNT (Vol. 2) #64. *Hun was a character originally introduced in the 2003 4Kids TMNT cartoon series. His history with Casey Jones was established in the episode “Meet Casey Jones” and revisited in “Dragons Rising”. *Hun’s history has gone through a bit of a change. In the animated series, he was subservient to the Shredder (his bio information claims the Shredder raised him, though this was never mentioned in the show itself) and led the Purple Dragons on Shredder’s behalf. Here, he is presented as having been a rival of the Shredder’s for control of New York’s underworld. Comic books incorporating characters and elements from their TV show and movie counterparts have become a fairly common occurrence. Harley Quinn and X-23 are probably the most obvious examples, but more subtle crossovers have been going on for years. Ninja Turtles has never been immune to this. The occasional “cowabunga” has found its way into a Mirage comic every now and again, if you want to go old skool, and heck, even the Foot Mystics who have appeared throughout Tales Vol. 2 were cribbed from the 2k3 series. However, Hun is a bit different. He represents perhaps the most overt crossover from TV series to comic and I know some fans were pretty resistant to the idea. 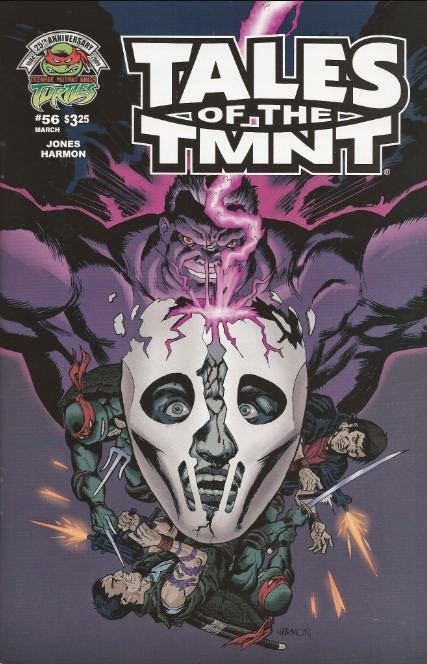 In the opening editorial for this issue, Dan Berger says that the TMNT don’t have a very impressive rogue’s gallery within the Mirage universe and the addition of Hun was a means to increase their stable of villains. I’m afraid I have to take issue with that; the Mirage TMNT have plenty of solid, quality rogues. The problem is that far too many of them are either “hi then die”, retconned out in an effort to make the official Mirage timeline leaner, or are simply forgotten and left with their threats unresolved (will we ever see the villains from Tales Vol. 2 #11 or #22 again?). Mirage has plenty of good villains, they just never give them the opportunity to be used to their full potential. And that’s why I take issue with Hun. His introduction here was great; don’t get me wrong. Tristan Jones carries over all the familiar elements of Hun’s character and background, including his history with the Jones family, and adjusts them perfectly to the new medium. No longer restrained by the limitations of Saturday Morning television, Hun can ditch the silly laser guns and goofy schemes and act like a real, gritty, blood-thirsty urban gang leader. I fear that Mirage will simply forget him just like they do with so many of their other villains introduced in the Tales Vol. 2 series. I’m sick and tired of villains being introduced as “the biggest threat since the Shredder, we swear!” and then being discarded for the next new thing, never to be so much as referenced again. With Mirage making such a big deal about Hun’s introduction into the official comic, I’m inclined to believe that won’t be the case, but who can ever be certain with this series? If Tales Vol. 2 is anything, it’s extremely fickle. Tristan Jones is a TMNT fanboy who has worked hard and is now living the dream: writing Ninja Turtles comics for the head honchos at Mirage. He interacts with the fandom frequently and is a terribly nice guy in his own right, but I’ll try not to let my personal experiences with him cloud my judgment of his work. Gotta be professional! 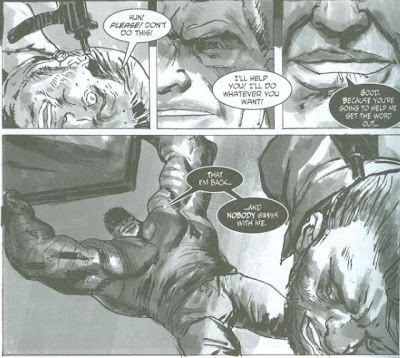 “Hun” follows on the heels of his first Tales story, “To Serve and Protect”, carrying over some characters from that tale (Miller and Lin) and referencing back to it. As such, it follows the story nicely and makes for some welcomed continuity. A problem I’ve always had with Tales Vol. 2, is that too few of the issues solidly connect with one another. I hope to see more of this, for if Hun’s threat is to be taken seriously, he’ll need to have more consecutive face time with which to build up a genuine threat, and not just be reduced to random acts of evil smattered sporadically about the TMNT’s timeline. We get some nice character work on Casey, going further than just having his “origin” from the 2k3 cartoon dropped into Mirage continuity. His encounter with Hun as a boy, the destruction of his father’s business and his father’s eventual demise are all retained, but given a darker edge to suit the atmosphere of this darker TMNT universe. In addition to this, we’re given a bit of an explanation as to why Casey can be so self-destructive and downright crazy. It reminded me a bit of what DC did with Guy Garder. Formerly a “swell” person with no personality, they put him in a coma and then brought him out with “brain damage” that turned him into a raging prick. Obviously, Casey’s and Guy’s mental disorders are only vaguely similar, but that’s the first thing that popped into my head. If the story suffers from any issues, it’s that it ends far too abruptly. The TMNT are seen stabbing Hun in the leg and then all of a sudden everybody’s in an ambulance. The End. It succeeds in leaving the audience begging for more, but still feels like they just ran out of space and had to end it. Paul Harmon’s art is as bee-yoo-tee-full as ever. These are the kinds of purdy pictures folks want in their comics, not so much the Lego-inspired artwork of Jim Lawson. The action is dynamic, the atmosphere is thick and most importantly, the characters don’t look stupid. Harmon is superb at laying on the grit, which fits Tristan Jones’ urban, street crime-oriented storytelling like a glove. At times, though, Harmon’s work can get a little too “inky” looking, but nothing as bad as, say, Joe Ng. 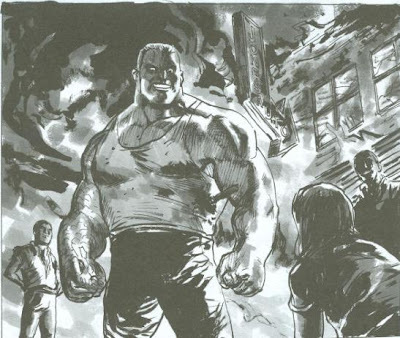 I’ve hardly anything negative to say about Harmon’s art and, really, if he can make Casey look cool with a haircut then he deserves some accolades. Overall, Jones and Harmon turn in another excellent Tale of the TMNT. Whenever I pick up one of their books I’m left with the feeling that, had Tales Vol. 2 been this good when it first started, it probably wouldn’t be floundering in sales. --> > Hooooooooo baby !! ! ! Damm your good at this !! i cant wait to get this comic. i had to pre order it. but i also wantes to share a cool turtle shirt thats up at red bubble. a ninja rap shirt. again congrats to this blog. due to my broken english i´d like to make some questions. when hun goes to april´s, is that a flashback? because you mentioned before that the purple dragon where eliminated by huu. what happened after hun eliminated the black dragon after being wipes out by hun? "And that’s why I take issue with Hun. His introduction here was great; don’t get me wrong. Tristan Jones carries over all the familiar elements of Hun’s character and background, including his history with the Jones family, and adjusts them perfectly to the new medium. No longer restrained by the limitations of Saturday Morning television, Hun can ditch the silly laser guns and goofy schemes and act like a real, gritty, blood-thirsty urban gang leader. I fear that Mirage will simply forget him just like they do with so many of their other villains introduced in the Tales Vol. 2 series. I’m sick and tired of villains being introduced as “the biggest threat since the Shredder, we swear!” and then being discarded for the next new thing, never to be so much as referenced again. With Mirage making such a big deal about Hun’s introduction into the official comic, I’m inclined to believe that won’t be the case, but who can ever be certain with this series? If Tales Vol. 2 is anything, it’s extremely fickle." Haha, I think Hun only appears one more time in the Mirage universe and that's it, you're right, he was forgotten. At least we finally got a proper Hun in IDW's comic series, since Mirage couldn't be bothered to keep him around or give Tristan Jones more issues to write. It's kinda funny looking back at all these Mirage issues from the early/mid 2000's and "fearing" everything that would be forgotten or lost in time, before IDW started and brought all this stuff back. I think IDW's Hun is also my favorite version of the character now. I swear, reading these old reviews is like traveling back in time. I got to hand it you though, you were right about this as well.